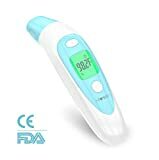 In the meantime there is a large number of clinical thermometers on the market, which differ from each other particularly in their application. After all, the body temperature can be measured on different parts of the body. For toddlers and babies, an ear thermometer is the easiest way to measure body temperature quickly and easily. An ear thermometer is a special type of clinical thermometer, which is used especially for small children and babies. This measures the body temperature via the auditory canal using an infrared radiator. It records the temperature of the eardrum so that it is displayed on a digital display. The same mechanism also has a forehead thermometer. There are now also ear thermometers that can be used as surface thermometers. This means that the temperature of baby bottles or bath water can also be measured with these, and the infrared radiator makes lightning-fast measurement possible. However, the speed may vary if the thermometer is used with or without a disposable cover. Some models require this protective cover, while others can be used without it. If the temperature of the eardrum is detected by the infrared radiator, the device converts it to the body temperature. Therefore, the specified value is usually very accurate. However, it is important that the cone of the thermometer is correctly seated in the ear. Some models indicate whether the ear thermometer is correctly seated in the ear. If a model is selected that is used exclusively for babies and toddlers, it has a small cone that is suitable for babies, making it even easier to use. 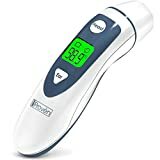 Many owners of small animals are also thinking about buying an ear thermometer to make it easier for themselves and the animal to measure fever. Unfortunately, an ear thermometer is not a good choice in this case. This is due to the fact that it is not really possible to position the thermometer or the cone correctly in the ear of a dog, since the auditory canal is much larger with this than with humans. In addition, the measurement result is not really reliable, especially since an ear thermometer is intended for humans and not for animals. In addition, the measurement result is most accurate in animals when the temperature is measured rectally. Fortunately, there are now fever thermometers, which are specially made for animals. 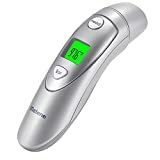 The advantages of an ear thermometer lie primarily in its easy handling and fast measurement results. This is suitable for the whole family and very hygienic, especially with protective sleeves. The additional costs for models with disposable protective sleeves can be mentioned as a disadvantage. In addition, the ear thermometer must not be used for inflammation of the ear and middle ear. The measurement result can also be influenced by too much earwax. Overall, an ear thermometer is ideal for rough orientation and control of body temperature. The best measurement result is still the rectal measurement of body temperature. Meanwhile there is a whole row at manufacturers, who offer among other things ear thermometers. Among these, Braun, Beurer, Omron, NUK and Reer have proven to be the manufacturers whose ear thermometers perform best in various tests. 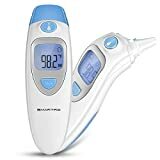 In addition to the manufacturers mentioned above, there are a number of other manufacturers who also offer ear thermometers in their product range. 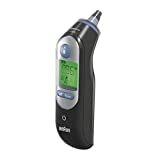 Ultimately, all ear thermometers work on the same principle – regardless of whether they are cheaper models or models from less well-known manufacturers. The accuracy of the measurement result is ultimately determined by correct handling.